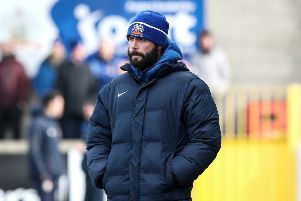 Portstewart boss Gary Taylor says his side will treat Saturday’s glamour Irish Cup tie with Portadown just like ‘any other game’. The seasiders were defeated 1-0 at home on Saturday against Moyola, in what was a scrappy encounter. Attentions now turn to the Irish Cup sixth round tie. “We will have a full squad to pick from,” explained Gary. “Stuart Millar and Luke Bradley have been out for about six weeks, and they both played without any problems on Saturday. Gary described Saturday’s tie as ‘the biggest game in the club’s history’. “It’s certainly the Club’s biggest ever home game. So how do you prepare to take on a top flight team, according to the Ports boss his side’s preparations won’t change: “We will keep everything as normal, we will keep the same warm up and the same team talk before. “My only worry is that on the day some of the younger boys may freeze. Myself and Aaron [Forgrave] will be telling the boys to go out and enjoy it. “We have nothing to lose.